Saturday morning of our trip to New York, we headed over to Freeman’s Restaurant. The restaurant is located at the end of an alley and it’s one of the most charming places I’ve been to in a long time. There were all kinds of wonderful taxidermy hanging from the wall, including a flying goose and even a bee’s nest. I noticed they had cinnamon lemonade on the menu and had to order it. It was so delicious and unexpected. In fact, right now our house smells like cinnamon because I’m making some cinnamon simple syrup to recreate this delicious drink. I’ll be buying lots of lemons this summer. Our brunch was great, so great in fact that we decided to head back their the next day for brunch with my former boss, Margaret. We got to try even more things off their menu and I enjoyed a few more glasses of cinnamon lemonade. 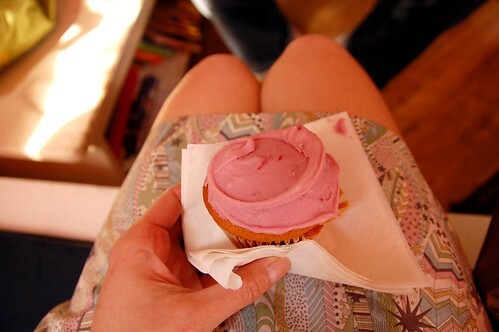 Our downtown travels also took us to Babycakes who make wheat, gluten, dairy, egg and soy-free baked goods. A cupcake never felt so healthy and it tasted great. I also love to stop by The Market on Mulberry on the weekend. I always discover something new there. This time it was Fine & Raw chocolate. I loved their packaging and picked up a stack of chocolate bars for gifts. 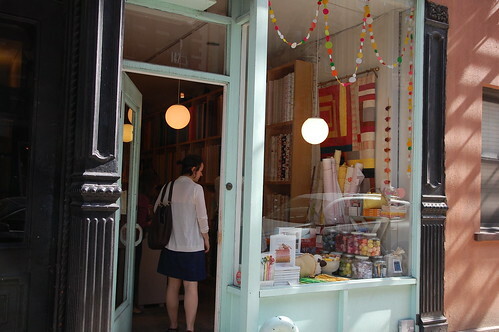 We stopped by Purl Soho to visit their tiny Sullivan Street location for the last time. They are moving to big and fancy digs on Broome Street in April. I’m excited to see what it will be like. They don’t allow photos in the shop, but this is some of the finest furniture craftsmanship that I’ve ever seen. It’s an old favourite and I always feel so inspired from being in their space. Men’s and women’s clothing shop from Sweden. I hadn’t been in this shop before and I loved their aesthetic. I’ve known them since they first opened and it’s amazing to see how the shop has grown. Filled to the brim with all kinds of design. Next time I want to go for dinner. If I lived in New York, I fear I would never want to eat anywhere else. 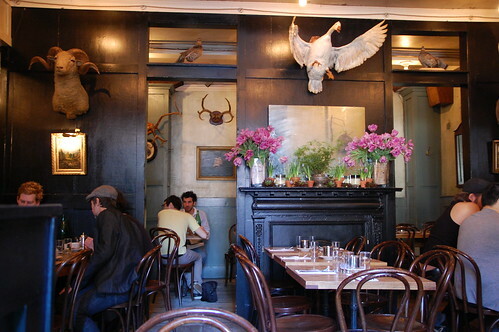 An extension of Freeman’s Restaurant, all their clothing is made in Brooklyn. There is a barber shop in the back when guys get a traditional shave! A shop for the ladies. I bought the most incredible lip balms here. Karyn your photos are simply striking. I feel like I am right there experiencing and seeing all of these things. I swear I can almost smell that cupcake. These photos also make me think that you would be a fab tour guide for NY.